What's up, podcast listeners! We are back with a brand new edition of the Sound and Fury podcast. Episode 19 features guests Patrick Epino and Stephen Dypiangco, the brainy, offbeat and ridiculously good-looking duo responsible for National Film Society. 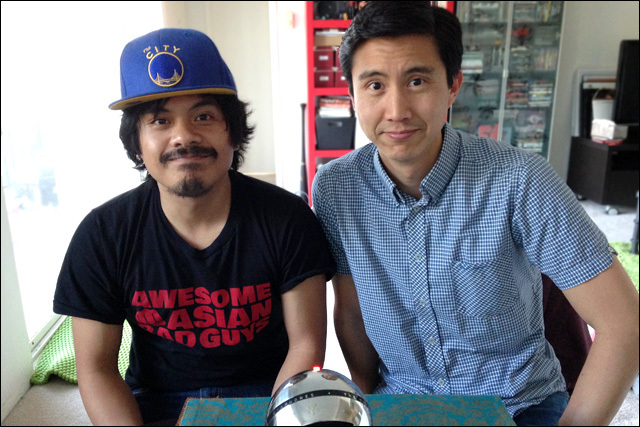 We talk about how they started working together, how they hooked up with PBS, and at long last, the release of our action/comedy Awesome Asian Bad Guys. Thank you to all the regular listeners of Sound and Fury. To catch up on previous episodes, check out the archive. To stay up-to-date with future episodes as soon as they drop, be sure to subscribe. You can also find Sound and Fury on services like iTunes and Stitcher, where you can rate and review the show. In episode nineteen, I talk to Stephen and Patrick of National Film Society about how two down-and-out filmmakers made a YouTube video with Cookie Monster, assembled a crew of Awesome Asian Bad Guys and shot a bedroom scene with their adolescent crush. Watch the trailer for Awesome Asian Bad Guys, starring Al Leong, Randall Park, George Cheung, Yuji Okumoto, Tamlyn Tomita, Dante Basco and Aaron Takahashi. Watch the original two-minute Awesome Asian Bad Guys video that inspired the feature, as well as all of the other fun videos on National Film Society's YouTube channel. Watch National Film Society's video with Cookie Monster. Watch National Film Society's video, featuring me, in which we name the Top 5 Bruce Lee Movies. Watch the amazing Al Leong Death Reel. Listen to my previous podcast conversations with Awesome Asian Bad Guys stars Randall Park, Aaron Takahashi and Dante Basco. Big thanks to Patrick and Stephen for taking the time to hang out. Special thanks to Sabzi for providing the music in this episode. And as always, huge thanks to everybody for listening. If you like the show, please share it and tell your friends. To stay on top of future episodes and updates, be sure to subscribe. Stay Angry.